The Hawaii Invasive Species Council approved a $5,750,000 budget for fiscal year 2015 (FY15, comprising July 1, 2014-June 30, 2015) on June 26, 2014, to support statewide invasive species prevention, control, outreach, and research. Forty-two FY15 awards were approved by the HISC based on recommendations from the interagency, staff-level Resources Working Group. To learn more about FY15 projects, click on any of the project titles below. A brief summary of HISC funding strategy and FY15 projects was prepared ahead of the 2015 legislative session and can be found here. Operates and maintains a 24/7 telephone contact service for members of the public. Provides a diagnostic service to members of the public and other conservation agencies. Develop, update and promote the www.littlefireants.com website. Manages the HAL web-based discussion group, currently comprised of 157 members. Produces “fact sheets” providing practical advice to residents and industry. Provides ongoing advice, expertise and assistance to island invasive species committees as needed. Works with Hawai`i County to manage Little Fire Ants in public access areas. Regular speaking engagements to associations and societies, public displays. Conduct regular training days for residents and industry groups. Provides training in identification, awareness and control practices to other agencies such as island ISCs, Hawai‘i Department of Agriculture and DLNR. Manages new detection of LFA on neighbor islands, develops and implements eradication plans for these. Conducts an extensive program on Hawai‘i Island to detect, prevent and mitigate infestations that threaten public safety or act as vectors for inter-island spread of invasive ants. Axis deer in Hawaiʻi threaten native forest and watershed health, impact critical habitat, reduce agricultural productivity, and pose serious risks to human safety. The Big Island Deer Working Group (BIDWG) works to ensure Axis Deer never become established on the Big Island. BIDWG was initiated by the Three Mountain Alliance and deer control was assigned to BIISC in 2011. The deer team was recruited by BIISC to coordinate what was expected to be a large, multi- agency incidence command team, focused on eradicating axis deer island-wide. In two years the team successfully located and dispatched 4 deer within two miles of the drop site. During the past 12 months, despite occasional reports, intensive helicopter and ground FLIR surveys of most of the island, no other deer sightings have been confirmed. No live deer have ever been confirmed by BIISC more than two miles from the drop zone. While it will never be possible to declare the island 100% deer-free, deer are below detectable levels now. This situation shifts the effort from control back to an early detection phase, where vigilance and response capacity remain high priorities, but control effort is not required on a daily basis. BIISC continues to maintain a scaled program to prevent the establishment of axis deer on the Big Island by meeting three objectives: 1. Ensure any remaining deer near the known introduction site are detected and dispatched. 2. Respond rapidly, intelligently, and effectively to any new deer introductions. 3. Increase partner involvement and participation. Hawaii Island is the agricultural and horticultural center of the State of Hawaii. A vigorous nursery import trade puts the island and the entire state at risk from imported invasive plants and pest species. BIISC’s early detection team has proven the effectiveness of roadside surveys (4000 miles, 108 new plant records, 3 eradications, 4 targets in a conclusion phase, in 5 years) and nursery surveys (10 of 24 planned nurseries surveyed, 4 noxious/invasive pests discontinued from sales, LFA detected in a new region, 7 nurseries signed on to the Plant Pono Endorsement Program, all in 5 months). 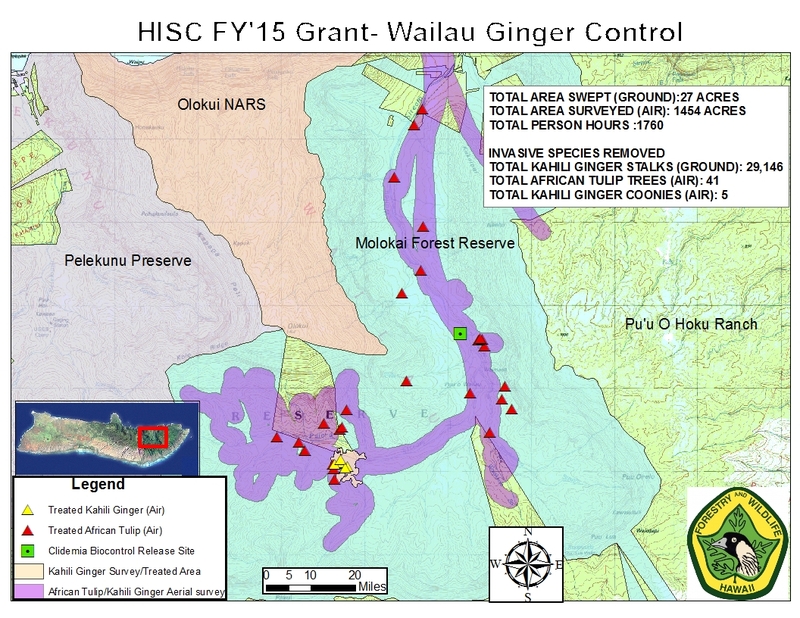 Funding provided under this proposal will be used to expand nursery surveys to 24 new nurseries in 2015, to continue roadside surveys in invasive species hot-spot zones, to publish technical reports on five years of early detection work on Hawaii Island, and to improve processes for vetting the feasibility and risk of potential target species. All said, the BIISC early detection program seeks every year to raise the bar on detection of new threats and cost effectiveness of response and control. DLNR is the lead agency responsible for minimizing the arrival, spread and impacts of alien aquatic organisms in Hawaii1. 1. In 2007 DLNR introduced ballast water regulations http://hawaii.gov/dlnr/dar/rules/ch76.pdf as a first step towards preventative management. The rules have become outdated and require revision. 2. Biofouling of ships and boats is a high risk vector for introducing marine invasive species in Hawaii and DLNR has made progress in addressing this regulatory gap. In 2014 DLNR collected data on boat and ship movements and maintenance activities and will use this to inform a biofouling policy. In 2015 DLNR plans to develop and consult on the policy. 3. Ships utilize in-water cleaning in port to reduce fuel consumption (and meet international emission standards) but the state does not have a framework in place to assess the risks of in-water cleaning. It is possible that this practice increases the likelihood of invasive species being introduced in the receiving port and stimulates pulsing of biocides (chemicals) when biocidal anti-fouling coatings are present. DLNR was recently identified to be the lead agency for this issue and is pursuing cross agency (DOH & DOT) engagement and industry data collection. 4. JTMD continues to arrive in Hawaii with non- native species attached and maintaining DAR response capacity remains a priority. The Hawaii‐Pacific Weed Risk Assessment (HPWRA) assists in preventing new invasive plants from entering the State and in reducing the spread of existing invasive plants. This voluntary screening system provides an objective, science‐based and accurate method of assessing the invasive potential of plants being imported into and/or planted within the Hawaiian Islands. Research demonstrates that preventing the introduction of invasive species is the most cost‐ effective option when dealing with invasive species. The HPWRA system is an integral component of state‐wide prevention measures. The deliverables for this project are: 1) 100 new or revised assessments fully integrated into the hpwra.org and Plant Pono websites 2) Reports: Annual report to the legislature on HPWRA progress and accomplishments and three quarterly updates; 3) Public presentations and meetings promoting and explaining the HPWRA & Plant Pono website. Measures of effectiveness include: 1) Number of agencies and private sector organizations that utilize weed risk assessments and 2) Number of species that are assessed using the HPWRA. Continued funding for the HPWRA will fulfill prevention objectives highlighted in the 2008‐2013 Strategic Plan of the Hawaii Invasive Species Council. This project will allow five DLNR staff to attend the Brown Tree Snake Rapid Response Team (BTS RRT) training in Guam, under the direction of the U.S. Geological Survey BTS RRT coordinator, Adam Knox. There are currently 23 staff at HDOA and five staff at DLNR who have received this training. This proposal would result in a total of 10 trained DLNR staff statewide, better allowing the department to contribute to an interagency response. The honeybee, Apis mellifera, is a significant pollinator of food crops with tremendous direct and indirect impacts on agriculture. In addition to honey and food crops, Hawaii is also one of the largest exporters of honeybee queens in the world. These exported queens pollinate a range of crops whose value is in the billions of dollars. The recent arrival of Varroa mites to Hawaii (2007 to Oahu, 2008 to Big Island) has devastated feral and managed honeybee colonies. The mite was likely present for over a year before detection on Oahu, as it was already widespread. Beekeepers on these islands are learning to manage the mites and rebuild, despite significantly higher losses, costs and effort. Concurrently, beekeepers on Varroa-free islands are expanding their industry to produce queens and honey for a strong market. They have a keen interest in preventing Varroa incursion. The Apiary Program staff (four individuals located in Hilo) travels to these islands to offer education events, and multiple incidents have triggered emergency inspections for Varroa (by beekeepers and HDOA Apiary Staff). The difficulty arises because the limited Apiary Staff cannot always respond quickly, beekeepers on Varroa-free islands have never seen Varroa in a colony, and the mite can be difficult to see even with trained eyes. This proposal aims to bring willing partner beekeepers to the Big Island, for a two-day training session where they can observe Varroa-infested colonies. They will then become official HDOA volunteers and serve as an educated resource in their Varroa-free beekeeping communities. These volunteers will help facilitate quicker response time to concerns, expand the Program Reach, and create locally available expertise and resources for beekeepers statewide. Despite substantial technology advances in the field of odor detection, scent dogs remain the most effective and efficient tool for detecting odors at low concentrations. Their widespread use in quarantine (biosecurity detection), drug searches, bomb detection and searches for missing persons is a testament to their utility. In recent years, scent dogs have been developed that are able to detect ants and differentiate individual ant species. For example, scent detection dogs are routinely used to detect incipient colonies of Red Imported Fire Ants (Solenopsis invicta buren) and Little Fire Ants (Wasmannia auropunctata Roger) in Australia. Little Fire Ants (LFA) pose significant health, agricultural, ecological, economic, animal welfare and quality-of-life threats to Hawaii. This species is routinely detected by agricultural inspectors in shipments of goods arriving from infested areas elsewhere in the state. Statewide resources are currently not adequate to inspect all high-risk businesses or incoming goods. The Little Fire ant is tiny, further complicating efforts to detect new populations before they become too difficult to eradicate. This proposal seeks funding to develop a Little Fire Ant canine scent detection team, including the training of up to two dogs and a handler. The acquisition and training of the dogs will be contracted out to a qualified professional with a proven track record in training dogs and handlers for this task. Once fully developed, this team will be used to detect LFA in high risk locations where they may exist in incipient form and for post-eradication detection and validation. We envisage that this team will act as a model for additional teams working within biosecurity and transportation agencies. This proposal presents an exciting opportunity for significant advances in invasive species detection technology. 6) Documenting non-target plant species to include in future testing of potential biocontrol agents; and 7) Documenting conflict of interest issues associated with managing albizia in Hawaii. This proposal will build on the research conducted to-date for two of Hawaii’s most problematic invasive species, Hedychium gardnerianum and Rubus ellipticus var. obcordatus. A biocontrol initiative for Himalayan ginger has been ongoing since 2008 for Hawaii and New Zealand and has prioritized a shoot mining fly and a rhizome boring weevil for specificity studies. Many more species of insects and pathogens show potential. The proposal aims to complete the host range testing of at least 1 species for Hawaii and comprehensively evaluate others, with the objective to submit an application for release, if scientifically appropriate. The biocontrol of Rubus ellipticus and Rubus niveus shows promise, with a scoping study in the Indian native range in 2012 highlighting a number of damaging insects and pathogens. In 2014, the biocontrol of both Rubus species will be investigated further with the goal of prioritizing species for further testing. This proposal will allow us to initiate comprehensive host range testing of species prioritized in 2014. Focusing on three invasive species with overlapping native ranges in the Himalayan region enables this project to maximise opportunities and reduce costs normally associated with single-species biocontrol programmes. Miconia is a listed noxious weed in the State of Hawaii and a HISC-priority plant species for control and eradication. Originally introduced on the Big Island in the late 1960’s; local, state and federal agencies have been cooperatively managing the spread of Miconia on the Big Island, Maui, Oahu and Kauai since 1990 (Chimera et al., 2000). In 2012, Herbicide Ballistic Technology (HBT) was introduced as a new, effective treatment that enhanced helicopter surveillance operations with a capability in real-time ‘target’ elimination of remote miconia populations. In the East Maui Watershed, this realization led to the adoption of a more comprehensive containment strategy with a greater emphasis on resources used in reducing satellite populations across the entire nascent patch network that encompasses 22,000 ha beyond the core infestation. In the first two years since adopting HBT, we have recorded more than 20 interventions, with 240 hours of operational flight time, dispatching close to 7500 miconia targets and protecting > 3800 ha of watershed. In our latest analyses, we have so far reduced target density of the entire satellite population network by 60%. This new project being proposed is a progression of the FY14 HISC project “HBT Targeting Miconia” where in 6 months we have effectively treated an additional 2541 targets (51% of target goal) using another 52 hours of operational flight time and only 37% inventory consumption (~56k projectiles). We are expected to meet (or exceed) the objectives of this project by the end of the calendar year. This new project will carryover by continuing progress in target density reduction and progressing with the implementation of effective containment strategies, via new batch inventory purchase and cooperation of shared resources provided by MISC, OISC and KISC (e.g., helicopter flight time). Further research will be conducted to improve HBT operations with better analytical details on the long-term management outcomes that are related to the adoption of this platform including: (i) technology improvements to the HBT system with increased data work flow, (ii) accurate projections of target density reduction, (iii) improved resolution in quantifying herbicide use and (iv) variable cost optimization of an effective miconia management strategy. The USDA Forest Service has emphasized development of new agents for miconia biocontrol in the last two years, in addition to maintaining projects on strawberry guava and Tibouchina and related melastomes. Increased technical support for quarantine rearing of prospective agents, combined with the work of a postdoctoral entomologist, has allowed us to complete a primary component of quarantine testing for one miconia agent (a leaf-feeding butterfly), and initiate evaluations of two others. Given the day-to-day requirements of simply operating the quarantine facility, our ability to pursue multiple concurrent projects is limited. Continuing support for an additional fulltime technician will enable us to maintain ongoing projects next year with two especially promising miconia agents: a fruit weevil and a fruit gall wasp. These have been identified as high priority agents because of their potential to impact reproduction and limit the spread of miconia. Both agents are technically challenging to rear in quarantine due to their dependence on fruiting trees for reproduction. Only with extra technical support can we maintain a reliable supply of host plants and test materials for evaluating these miconia agents. Identification of optimum quarantine procedures for infested nursery plants. The only current quarantine treatment approved by the Hawai‘i Department of Agriculture is a pot drench using Talstar SelectTM. Although effective, this product is only available for use by commercial applicators licenses in the state of Hawai‘i. Many larger and almost all smaller nursery enterprises do not have this certification. We aim to identify appropriate “non-restricted” pesticides that could be used as an alternative and provide HDOA with appropriate rigorous data to have alternative products approved for quarantine use. Foraging dynamics and nutrient flows. Lack of knowledge regarding the unusual diffuse colony structure and worker:queen ratios demonstrated by LFA present impediments to effective treatment. For example, the rate of worker and food exchange between colony nodes will determine how far individual bait granules or drops of bait need to be placed in order to reach every colony. The paths that various nutrients travel within a colony node (lipds vs carbohydrates, vs proteins) will guide the formulation of optimum attractant. None of these data are known to science. Parity between field and in-vitero results. Bioassays using laboratory colonies are often used to test the efficacy of pesticides and baits because such experiments are less costly and allow multiple treatments to be tested simultaneously. Often there is extreme disparity between the results of laboratory trials and field tests. A captive colony may be too small to allow normal food exchanges to occur, and the artificial diet they are fed prior to or during testing can dramatically affect results. We propose to refine our knowledge of the causal reasons for this so that more reliance can be made on the results of laboratory trials, thus reducing the costs of experimentation. This project will seek to develop an UAV-based aerial mapping and management tool for introduced plant species on Hawaii Island by assessing the impacts of canopy openness and flight parameters on detecting a sub-canopy tropical invasive plant using a small unmanned aerial system. To assess the effectiveness and efficacy of conservation actions throughout the state we need to take a comprehensive look across landowner and agency boundaries. Unfortunately much of the data needed to make these assessments is reported in narratives or incompatible data structures. The time is ripe to create a reporting framework that spans agency’s and funding mechanisms. This complicated task has become easier and more cost effective to do. New tools such as ESRI’s ArcGIS Online allow us to share data and create user friendly web mapping applications with a very low cost. Previous funding from HISC and DOFAW’s watershed protection program have created data standards and reporting structures that can be used to evaluate actions on the ground. We will take a collaborative approach to bring past standardization exercises and current technology together. We will identify key people and collaborate with them to evaluate and modify the existing reporting structure to accommodate all funded HISC deliverables. We will leverage our work with the watershed grants to create a working prototype to collect, aggregate, and dynamically display funded HISC deliverable data. Output reports will be 1) web based 2) spatially and temporally explicit 3) scaled appropriately to share with the legislature and the public. The products of this project will integrated in to a web-based mapping and communication system for partnership programs and agencies that will provide information on the distribution, on-going control work, and status of key invasive species. The Hawaiʻi report-a-pest invasive species reporting system consists of a suite of web-based products and tools that facilitate the capture, management and referral of pest reports from the public; provide efficient methods of interagency communication; provide notification of incoming reports in near real-time; and increase public awareness of invasive species early detection. This FY15 proposal provides the means to fully integrate the reporting system components with the HISC council agencies and brand it as a HISC council product. Council partners will be fully engaged in the products via technical trainings and members of the public will be engaged via educational outreach. These core funds represent the critical threshold at which the report-a-pest system can be curated on a daily basis by dedicated staff. CGAPS is requesting funds for core payroll support and operating costs for the Project/Outreach Coordinator. The goals of this position are to facilitate engagement and inter- and intra-agency communication; to coordinate collaborative projects towards the goals outlined in the CGAPS Action Plan; and to prioritize outreach messages, methods, and audiences; to educate decision makers, special interest groups, and the public about invasive species in order to effect a change in perception, actions, rules, or funding for invasive species issues. HISC contributions to the core support for the CGAPS Project/Outreach Coordinator (100% FTE, cost shared by multiple agencies, NGOs) will enable progress on the 2014 work plan and prevention projects, the CGAPS Action Plan, and public outreach assistance on high priority pests for partner agencies. Little Fire Ants are ubiquitous and well-established on the windward side of the Big Island of Hawai‘i. Scattered populations can now also be found along the west coast from Kailua-Kona to Captain Cook. Additionally, a small isolated outbreak has been detected in Naalehu township and a second outbreak in Waipio Valley. These small outbreaks are ideal candidates for “spot- eradication because the communities are small and geographically separate from other populated areas. This proposal seeks funds to plan and implement a community-based approach to eradication LFA. This project will produce a four-part panel series for television that addresses current topics in invasive species control and biosecurity. The series will raise public awareness of threats to our islands, share steps to increase the public’s involvement in early detection and control, and provide a forum for professionals in the field to share information. The series of four hour-long programs funded by HISC in 2006 continue to air on Olelo and University of Hawaiʻi channels. We propose four similar programs on these four topics: 1. Little Fire Ant 2. Coconut Rhinoceros Beetle 3. Hull Fouling 4. Mosquito Surveillance. The Division of Aquatic Resources Aquatic Invasive Species program is focused on the control and prevention of aquatic invaders throughout the Hawaiian Islands. Outreach is an essential aspect of controlling and preventing aquatic invasive species. Outreach events not only help educate the public on invasive species issues through identification and detection, but also provide activities for families to participate in conservation projects within their communities. The AIS program currently has a project underway to control invasive algae in Kaneohe Bay through mechanical removal (the Super Sucker) and by replenishing native herbivores (collector sea urchins, Tripneustes gratilla) onto affected reefs. Outreach efforts have focused on topics related to this project in an effort to gain public support and community involvement. Over the last few years, the AIS program, by means of support from the Hawaii Invasive Species Council (HISC), has increased outreach and education programs and events to inform and involve local communities in invasive species issues on the Hawaiian Islands. Funds requested from HISC will cover costs for the production of banners, brochures, workshop fees, and other outreach swag. State funds will cover staff time to conduct outreach events and speak to the public. Invasive species outreach and education is an integral component of KISC’s program objectives. Engaging the community and having them become invested partners is the ultimate goal. By having a community that cares about protecting the environment that surrounds them, we can rely on them to: help with early detection, be good stewards of their own property, influence policy makers to help prioritize invasive species work state-wide, and transform public perceptions regarding the importance of preserving Hawaii’s unique biota. Methods for engaging the public include participating in events, publishing outreach messaging, creating displays, using digital marketing, and more. This funding will support KISC’s full-time outreach position and expenses associated with this outreach program. These funds will allow OISC to maintain and increase its outreach activity capacity developed using previous HISC funds and continue to implement other outreach programs on O‘ahu that will support the HISC statewide public outreach goals. Funds will contribute to the salary of the outreach specialists and pay for related supplies and services. Highly trained staff will educate and engage the public at local events and community meetings. Staff will share printed materials and use broadcast media to inform students, teachers, policy makers, funding agencies and the general public about MISC and MoMISC targets and HISC objectives. Efforts will continue to build awareness about the little fire ant with emphasis on reporting suspect ants. Staff will engage local students and teachers through classroom visits using the Hō‘ike o Haleakalā curriculum. Targeted surveys related to inter-island biosecurity will help shed light on the continued movement of invasive species between islands. Project success will be evaluated using established measures of effectiveness and during annual review of the outreach programs by Committee members. The BIISC Education and Outreach Program is building strategies that work for a large island with a small rural population. Our goals include changing attitudes and behaviors toward invasive species management, and making use of the independent Big Island spirit to increase personal commitment and responsibility. We take a hands-on, program-wide approach to public engagement, through our community training and assistance programs, while making use of professional communications firms to develop messaging and products that effectively convey the professionalism and expertise of the BIISC program. Building on successful neighborhood models now working in Waimea, Volcano, South Kona, and Puna, BIISC will continue to empower communities to advocate for and participate in invasive species control in their own backyards. Significant outreach effort will go towards early detection surveys of Big Island nurseries and promoting Plant Pono, a program that incentivizes use of best management practices and halts interisland movement of invasive species by the horticulture trade. Education on core invasive species concepts, publicity for BIISC target species, and building support for biocontrol remain important pieces of our education program, as distrust and misinformation about invasive species management are still common on the Big Island. KISC continues to work on priorities outlined annually by HISC as well the priorities of other funding sources. Priority is given to early detection, response, and control of various plants, vertebrates, and insect targets. KISC’s top priority species include miconia, mongoose, little fire ant, and coqui frog, as well as other newly introduced plant species. Funding from HISC will be applied to KISC’s capacity as an ongoing HISC project. Serving as Kauaʻi’s “first line of defense”, KISC works in collaboration with other partners on Kauaʻi as well as statewide to address priority invasive species by incorporating fieldwork, outreach, and current technologies. Project deliverables will include detection and removal of high priority invasive species, an annual report, and supporting data. Measures of effectiveness will include details of number of species controlled, acres treated and surveyed, and person-hours per target expended. OISC is a voluntary partnership of private, governmental and non-profit organizations, and individuals united to prevent new invasive species infestations on the island of O‘ahu, to eradicate incipient species, and to stop established species from spreading. The partnership helps protect a wide range of environments by targeting selected invasive species for island-wide or localized eradication. OISC works to eradicate those species that, left uncontrolled, will so severely disrupt the island’s ecosystem that essential services such as recharge of the island’s aquifer and protection from wildfire will be lost. OISC works with multiple federal, state, private and public partners and maintains the support of private landowners who allow OISC field crew access to their property for invasive species control. This funding will support management programs for 14 plant and four animal species, and the Oʻahu Early Detection program (OED), a partnership between OISC and the Bishop Museum, which connects invasive species management to herbarium-based research. 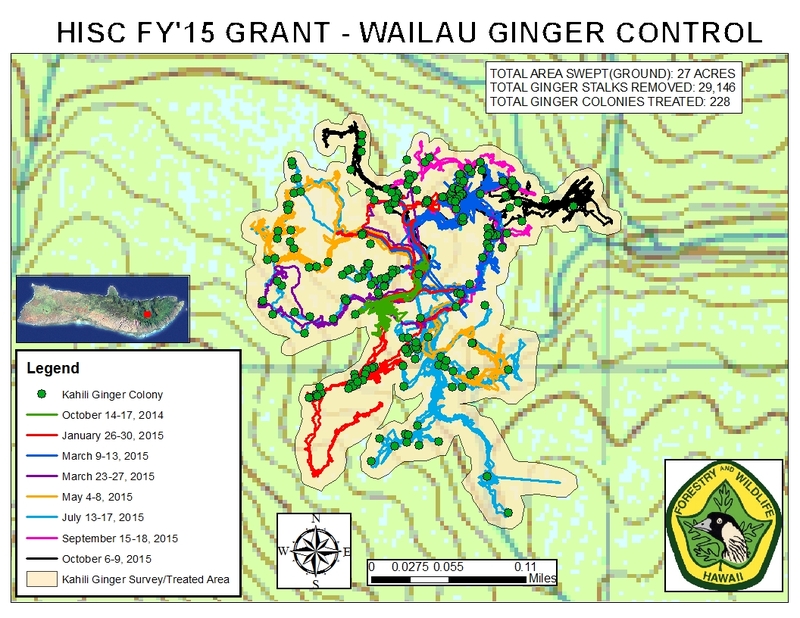 HISC funding will support ground and aerial detection and control work in Maui County on 30 plant species, 3 vertebrate species, 4 invertebrate pests, and 1 aquatic species, using an island- wide, landscape-level approach. MoMISC will also serve as an early detection center for agricultural pests. Special emphasis will be placed on detecting and responding to new incursions of little fire ants and working to address the movement of invasive species between the Hawaiian Islands. Funds will help retain and rebuild essential staff capacity, secure citric acid for coqui frog work, and provide helicopter time for aerial reconnaissance and control of miconia and pampas grass. The Island of Hawaii has extraordinary natural resources from mauka to makai, with 98 T/E species, more than 75% of the state’s strategic conservation lands and more than half the Agricultural Lands of Importance to the State. Invasive species pose one of the greatest threats to the long-term viability of native ecosystems, watersheds, and a thriving agricultural and horticultural trade. Following 4,000 miles of Early Detection Surveys, an updated strategic assessment, and ongoing organizational restructuring, BIISC is well-positioned to tackle nine rapid response and priority plant target species with the goal of island-wide eradication. The requested funds will be leveraged by $400,000 in federal and private funds applied for and/or awarded for FY 2015, for public education, ED/RR activities related to incipient invasive species as well as the control of previously identified targets. Train staff on other islands (DLNR, ISC, other agencies) to launch robust early detection programs and train to participate within the ICS framework currently established. Conduct research needed to develop strategies for the control of CRB. As the pilot program has shown positive results the Department of Parks and Recreation of the County of Hawai‘i would like to establish a Little Fire Ant control program to reduce, control, or eradicate other areas of the Big Island. Part of the funds will be used to employ three fulltime staff members dedicated to fighting the Little Fire Ant infestation island wide. The remaining portion of the funds will go towards pesticides, equipment, and transportation needs. DOFAW’s Molokai Forest Reserve consists of approximately 11,690 acres of a mixture of timber plantation, native forests, as well as non-native forests. Of these 11,690 acres of forest reserve, 5,770 acres is situated within the Molokai Forest Reserve – Wailau section. 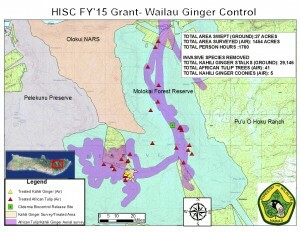 Control efforts will target the only known population of Himalayan ginger located within the valley area. Recent aerial and ground surveys show that this is most likely an incipient population. This area is located adjacent to both the DOFAW’s Olukui Natural Area Reserve and The Nature Conservancy’s Pelekunu Preserve. In addition to the upper reaches of Wailau valley, these areas are primarily comprised of intact native forests and have been classified as ‘highest quality native ecosystem’ in the DOFAW’s 2009 Molokai Forest Reserve Management Plan’s levels of vegetation classification. 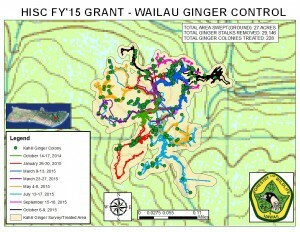 The DOFAW Maui Nui Forestry Section’s goals are to 1) Increase overall management efforts and treatment frequency from current levels; 2) Control incipient Himalayan ginger population located within the core area; 3) Control known outlier populations within the Wailau section; and 4) Continue to monitor and maintain any early detection of Himalayan ginger populations, as well as detection of other incipient weed populations that may establish and threaten adjacent native forests. This project will facilitate the implementation of an eradication program for the highly invasive plant, cane ti (Tibouchina herbacea), at Poamoho at the summit of the Ko‘olau mountain range. Cane ti threatens priority watershed habitat in Poamoho, a region that hosts 11 animals and 18 plants with federal status, meaning these species are vulnerable to or have a high risk of extinction. A partnership between DLNR DOFAW NARS, KMWP and OISC promises to effectively address the management of this highly invasive plant, which can invade pristine native forest and is found in only one location on O‘ahu. This partnership will utilize highly skilled staff to execute management actions, conduct data analysis and develop adaptive management strategies to ensure eradication. The requested funds will allow for the continuation of: investigating mongoose sightings, rapid response, tracking and trapping and outreach and education. It is not currently known if a small incipient population or breeding population of mongoose exists on Kauai, hence the need to remain vigilant in response to sightings. An established breeding population of mongoose would be devastating for at least eight species of Hawaii‘s endangered birds, as Kauai is considered the last strong hold for these species due to the long term absence of mongoose. Serving as Kauaʻi’s “first line of defense” for mongoose for the past 11 years, KISC works in collaboration both with partners on Kauaʻi as well as statewide to address mongoose issues. Maui has reached a critical threshold with the growing population of axis deer. The multi- stakeholder Maui Deer Working Group hired a Coordinator to implement a comprehensive Management Plan. Over the last year, the MDWG has completed the first meaningful population estimate for axis deer on Maui; begun collating information on harvest levels from multiple sources, including the DLNR DOFAW damage control permits; launched a public survey to develop Management Focus Areas; encouraged private landowners to increase control efforts; and conducted outreach about the issue. Proposed activities include further population estimate refinement by collecting information on doe-fawn mortality with radio collars; initiating a pilot fence project; conducting aerial control efforts with cooperative landowners; and enhanced public outreach efforts. A population of feral goats has been growing on the ridge behind the Oceanic Institute and Sea Life Park at Waimanalo for several years; the animals are likely escapees from nearby farms. It was reported in 2012 that mouflon sheep were also present in the area. Free-roaming sheep are not present anywhere else on O‘ahu, and eliminating this population while it is small is a high priority. The possibility of having the animals removed by the residents of the nearby leased farms was explored and proved to be non-viable. KMWP will continue to seek control and eradication of these populations. This project will increase distribution rate of this extremely important and much needed bio-control agent for strawberry guava. DOFAW has an established working relationship with Mr. Tracy Johnson of the USDA, and will continue to work closely with Mr. Johnson to refine introduction methodology and maintain and conduct quality control on data management and collection. In addition, DOFAW will be the point of contact for interaction between USDA and HDOA facilities and partnering entities, manage an inventory of inoculated plants, assist in propagation of untreated plants, coordinate the deliveries of treated and untreated plants to partnering entities, and provide technical support and resources for partnering agencies and other interested landowners. The goal of this project is to eradicate Big-headed ants (Pheidole megacephala) from Green Island, Kure Atoll (184 acres), and document the project with a paper published in a peer- reviewed scientific journal. The State of Hawaii, Department of Land and Natural Resources, Division of Forestry and Wildlife (DOFAW), is committed to restoring native biodiversity and seabird populations on Kure Atoll. Green Island, the atoll’s only permanent island, is the State of Hawaii’s largest and most diversified seabird sanctuary, with 18 seabird species totaling over 250,000 birds nesting on the island. In 1995, the State successfully eradicated rats from Green Island and created strict bio-security measures followed by other Northwestern Hawaiian Island managers. In 2010, the State began a 10-year Verbesina encloides eradication program that has already released the habitat from the negative effects that this tall weed has on the reproductive success of seabirds. After predator and weed removal, some seabird species returned (small petrels) and others increased in population size (ground-nesting boobies, Christmas Shearwaters and albatrosses). However, the spread of Big-headed ants (Pheidole megacephala) has severely threatened recovery of the small petrels by degrading and displacing seabird nesting habitat on a large scale. Recent plans and recommendations to create additional populations of endemic passerines such as the Nihoa Finch, Nihoa Millerbird, or Laysan Finch cannot be executed without eradication of Big-headed ants due to anticipated effects of ants on eggs, chicks and adults. Angiopteris evecta (giant fern) is a highly invasive fern in Hawaii, with a very large growth form (up to 7 m tall). It displaces native tree ferns and other native plants by forming a dense canopy and spreading rapidly, especially in stream gulches. Although A. evecta is established along the lower elevation Poamoho access road, it is rarely seen at the summit. However a large core population is concentrated in a central drainage of the upper Poamoho forest. Poamoho is an area of high biodiversity, contains numerous endangered plants and animals and is a high priority management area for the Department of Land and Natural Resources Watershed Initiative Program that is being fenced to exclude feral pigs. KMWP has funding from Kamehameha Schools (KS) to control A. evecta on KS lands at Helemano (adjacent to Poamoho). The requested funds will supplement that effort in 2015. The core infestation of A. evecta on state land near the summit covers approximately 20 acres. An aerial survey in January 2014 showed dense coverage of A. evecta extending downstream, with individual plants occurring sporadically in the surrounding forest (see map). The fern spores are wind and water dispersed, and mature plants at the stream headwaters and the summit crest create a source for spores to travel downstream and to be blown to other drainages across the Ko‘olau Mountains. Control is essential to prevent A. evecta encroachment in the upland native forest of the northern Ko‘olaus, and to protect the high-value Poamoho forest. Photinia davidiana is a shade tolerant, perennial, 1-3 m tall that forms dense thickets. It is an invasive weed that competes with native plants for space and nutrients. Photinia inhabits, at low to medium density, several hundred acres of the Hakalau Forest National Wildlife refuge, and the adjacent State Game Management Area (Piha). A previous weed survey in the refuge, documented a large increase in the frequency and abundance of this species between 1987 and 2007. TMA staff began working in this area with ISST in 2013 and observed the expansion of the weed since 2007, although it is still limited to one area in Hakalau and Piha. The current limited distribution of Photinia, coupled with the serious threat posed by this species, recommend the plant as a candidate for island eradication. TMA and partners including MKWA, BIISC, and FWS can pool resources and capacity to apply a consistent and comprehensive control effort of Photinia. TMA and partners plan to thoroughly map the infestation at Hakalau and Piha. Additionally, TMA and partners will conduct herbicide treatment trials to improve on current treatment success and efficiency. And lastly, once a successful and effective treatment is identified, TMA will develop a strategy for control, either eradication or suppression, and implement control strategies across the infested area. Natural Area Reserves are established to preserve in perpetuity representative examples of Hawaii’s ecosystems in as unmodified a state as possible. DOFAW manages five areas as Natural Area Reserves on O‘ahu (Ka‘ala, Pahole, Ka‘ena, Kaluanui, and Poamoho). Within three of these reserves, DOFAW staff manage seven species of plants that have limited ranges but have a high potential to significantly alter the ecosystems in which they are found. In FY14, DOFAW nearly doubled the acreage under NAR management on Oahu with the addition of Poamoho (1,400 acres) and Kaluanui (500 ac.). Due to the increase in management area, DOFAW is requesting funding to support ongoing incipient control management actions at Ka‘ena, Pahole and Ka‘ala. The Division of Aquatic Resources (DAR), Aquatic Invasive Species program is continuing its priority focus of controlling invasive algal (Smothering seaweed) overgrowth on the coral reefs of Kane‘ohe Bay. Building on the success of previously HISC funded projects; the requested funding will support the addition of two new KUPU interns. One intern will provide help in the sea urchin hatchery caring for juvenile urchins, cleaning tanks, counting larvae, and any other necessary duties. The other intern will serve on the field team conducting alien invasive algae removal operations, outplanting of hatchery raised urchins, and monitoring the effects on treatment, control, and reference reefs in Kane‘ohe Bay. In addition, both interns will be given an independent research project to collect data on unanswered questions within the hatchery and in the field. Results from these small scale projects will be provided to HISC. EMWP lands consist of approximately 120,000 acres of primarily native forests on Maui. The lands are contiguous with The Nature Conservancy’s Waikamoi Preserve and Hanawi Natural Area Reserve. All together these lands make up the biggest and most intact native forest area on Maui. One of these areas – Lower Koʻolau Gap – has very dense stands of strawberry guava (Psidium cattleianum). This dense area in the lower heart of the watershed is an ideal location on Maui to test the distribution of the recently approved biocontrol agent Tectococcus ovatus. HISC Support Staff Progam: $226,700. Supports two temporary positions, including the HISC Interagency Coordinator and HISC Planner. Also includes operational funds for FY15, including $50,000 to contract an economic analysis updating information on the cost of invasive species in Hawaii, to generate better cost-benefit analyses for projects. DLNR Division of Forestry and Wildlife Overhead: $201,250. As administrative host of the interagency HISC, the DOFAW Admin office applies a 3.5% overhead to funds disbursed on behalf of the Council.